Published on May 13, 2011 in Bands/Artists, Downloads, Eastern Iowa, Music, Out and About, Personal History, Upcoming Show and Vinyl. 0 Comments Tags: "thrill jockey", CD, Chicago Underground, Delmark, Double Demon, dubuque, Dubuquefest, IA, Isotope 217, Jason Adasiewicz, John Herndon, mp3 download, Rob Mazurek, upcoming release, Vinyl. On a snowy night in January I had an opportunity to see Rob Mazurek’s newest band in an incredibly intimate setting at Monk’s Kaffee Pub in Dubuque, IA of all places. 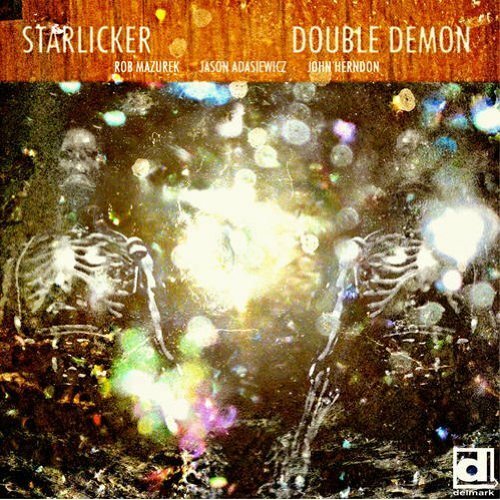 Starlicker is a trio made up of cornet player Mazurek, Jason Adasiewicz on vibes and John Herndon on drums. The trio played a dynamic set of improvised jazz punctuated by frenetic and muscular solos by each. I had my appetite whetted for their eventual release titled Double Demon, which is due out on 5/17 on seminal jazz and blues label Delmark. Double Demon represents another title in Delmark’s recent re-entry into the world of vinyl– Mazurek’s last release with his band Exploding Star Orchestra (of which Adasiewicz and Herndon are also members) Stars Have Shapes was part of Delmark’s first two releases, so it’s clear that they want to take advantage of Mazurek’s following, who may know of him from his Thrill Jockey releases as Chicago Underground and Isotope 217. In conjunction with the release, the trio is heading out for a few dates in the Midwest and East Coast in May, with another stop in Dubuque on May 20th for Dubuquefest– a free arts festival. I also recorded the full show with my handheld recorder and Rob gave me permission to post a track. 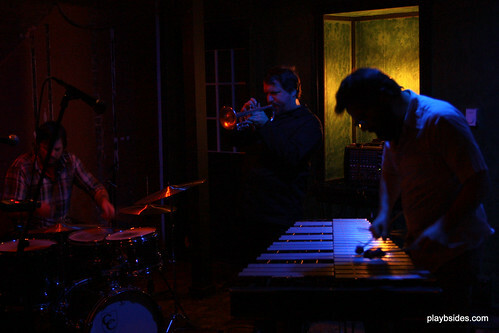 This is an mp3 of “Triple Hex” live at Monk’s Kaffee Pub, January 18, 2011. The Time to play b-sides archives for the dubuquefest tag.